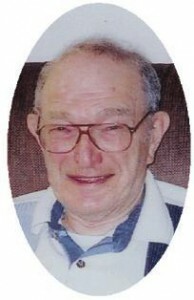 Paul J. Godersky, 84, formerly of Jefferson Street in Port Washington died Thursday, June 26, 2008 at Lasata Care Center in Cedarburg, Wisconsin. He was born June 25, 1924 to Earl and Clarlinda Penkwitz Godersky. A life long resident of Port Washington, he fished Lake Michigan of tugs Lester, Herbert, Merlin and Oliver Smith with his father. He served in the Navy during World War Two on the USS Donaldson as a Gunners Mate First Class. While in the Navy he took up boxing. When he returned from the war in 1946 he continued fishing. He married Beverly Schultz of Port Washington on October 19, 1946 at St. Mary’s Church. In a winter storm in 1947 he was swept up and then worked with the Civilian Conservation Corp (CCC) and later took a welding job with the former Kwik Mix in Port Washington. In 1951 he re-enlisted in the Navy and served in Korea, returning in 1952 to work at Kwik Mix (later PCM) until 1974. He served as Past President of International Association of Machinists & Aerospace Workers Local 1430. Paul operated the Columbia Bar & Grill at Dodge & Wisconsin Streets in Port Washington from 1974 to 1979 with his wife. Later he took a Janitorial position with Port Washington Saukville School District. He enjoyed fishing, hunting with his buddy Duke, bowling and Port Washington Laker Baseball. After his heart surgery years ago he was an avid walker about town. His wife Beverly preceded him in death November 15, 1993. He is survived by his children Donna (Donald) Greiveldinger, Gerald (Carron) Godersky both of Port Washington, Carla (Jeffrey) Leak ofBelgium, Paula (Todd) Freeman of Grafton and Geralyn (Thomas) DeBroux of Ripon, 12 grandchildren and 13 great grandchildren. Further survived by a brother John (Pat) Godersky of Fond du Lac, sister Ethel Demge of Port Washington, sister-in-law LaVern Godersky also of Port Washington other relatives and friends. Preceded by wife, Beverly, daughter Gail Volkmann, sisters Shirley, Jane and Myrtle, brothers Elmer and James and brother-in-law Virgil Demge. Funeral services 6:30 pm Monday, June 30, 2008 from the funeral home to St. Mary’s Church for Mass at 7 pm. Interment parish cemetery. Visitation 4 – 6:30 pm Monday at the funeral home. Memorials to the Alzheimer’s Association appreciated.